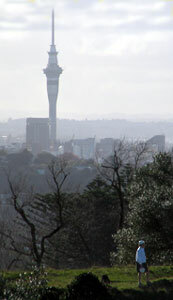 The Crater Cup - Auckland, New Zealand. 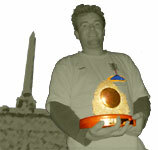 As the 2004 winner, Simon Feasey embraced one of the main traditions of the Crater Cup: he who wins organises the next year. And what a grand job he did for 2005! You can see the full story of scoring by checking out our exclusive hole-by-hole Crater Cup Super Analysis, courtesy of Freaky Styley Stats Division - click here or on the image below to view a 170k web page showing the scores for every hole for every player as well as showing the hardest holes for each round and more (opens in a new window). Anyway, scoring schmoring - it's the pictures and the story we want! And so we asked the first overseas winner of The Crater to put virtual pen to virtual paper and give his run down of the drama that was the 2005 Crater Cup. As the sun finally beams down, several groups compare notes at one of the course intersections. Everything seemed to conspire to enable me to attend the Crater Cup this year, and what an experience it was. I was told to bring the essentials, passport, thermals, raingear, cleats, money & discs, but apart from that, I had little idea of what to expect. 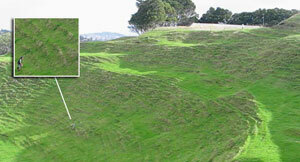 The Crater Cup is one leg of the NZ Tour and is held at Auckland’s One Tree Hill, a park based around a steep hill with a few craters, that is an active farm, with sheep and cattle grazing. This year’s event was organised by Simon Feasey, last year’s winner, who designed the course, and saw 20+ players from NZ converge on the Saturday morning for the start of the event with some, coming up from Wellington, barely making it through the highway before it was closed off due to a blizzard. 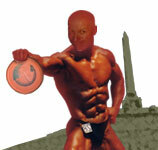 The only female competitor in this year's tournament, Juanita Unda shows balance and poise in the volcanic setting. The weather was a big factor, as it is anytime you try to throw a disc into a gusty 20-40-knot wind with occasional rainsqualls, as too was the steepness of the terrain. I tried to prepare for both, but had never experienced either before to this extremity. Combine the two, together with a tough course and you have a scenario that will test all & see some interesting competition. I had arrived on Thursday arvo, and was picked up by Gabb (aka Juan Unda) from the airport and taken to his home, where I was introduced to the portable NZ baskets Simon makes, and are used in most of the tour events. 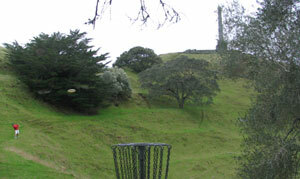 So of course I got out some discs & had a few putts before we went to a traditional NZ (Irish) pub. Friday saw a bit (lot) more putting before meeting Simon (where’s my umbrella my shoes & oh well lets go home it’s raining) Feasey, to mark out, view & throw a few shots around the course. 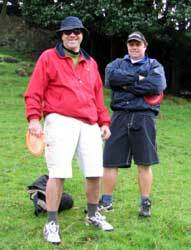 This was also the first time I got a chance to see any of the the competition & how I compared, and with Bob Gentil out with an injury (see www.discgolf.co.nz for the story) Simon was basically it, or so I thought. The first trip around was as much about admiring the view, checking out the hazards, figuring out how to play in the condies (local speak) than it was about a score or working out who could throw the furthest. At the end of the round, I could have probably halved the number of discs I was carrying (I brought 25 with me) as pretty much all rollers (too rough or long grass) & light/no wind discs (even down wind you needed control) were basically unusable, but instead bought a champ Orc to add to the tally & make my bag heavier. After the round, we went for lunch in a traditional NZ (English) pub that had a nice selection of beers. Once again I got caught out with the reverse sized gold coins but at least it stopped me from thinking I was in Bondi (OK, the weather did that!). The format was 2 rounds per day, with the first round hat doubles and the next three singles. So after the baskets were put out & the teams & groups decided, we trekked off to our starting hole. I was paired with Nigel, and after a nasty #3 (our 2nd), we got into a pretty good rhythm, good shots & tactics, to enable us to shoot a 54, 3(?) behind the super-stacked team of Simon & whoever gets drawn with Simon. Hole 10 was enough to make anyone crazy and such was the case for Chris! For many, this was the first taste of the course, and for others the course under these conditions, and the errant shots that got blown into a crater, behind them or dived to the left or right unwanted & unexpectedly, were signs of things to come. Every so often the sun would poke out through the storm clouds. Which usually meant rain in 5 minutes! After lunch, groups for the singles were formed and we began our lap of the hill for the second time. I began on #2 again and despite having chances for better scores, was content to start with 4s for the first 3 holes, remembering the saying – “you can’t win a competition in the first round, but you sure can lose it”. On many holes you could see groups in front & behind, and watching Simon’s 2nd on #3 sail over his head & land ~20m behind him, confirm that low scoring was going to be tough. I played pretty well, with a 2, 3s, 4s & a 6, to finish up with a 63. As the scores came in the leaders emerged, with Simon on 61 (without a single 2), Dean & Chris on 62, myself on 63 and 2 other players (Juan & Dylan) on 64. My 6 wasn’t the highest on a hole, with a few 8’s & a 10 being recorded. That night, the party organised at Gabb’s, including backyard-putting comps, revealed how stuffed people were from the day’s competition. None one turned up & I was in bed by 8:30. Well not quite, but I think that could have been what everyone else did, in a bid to be ready for the final 2 rounds on the Sunday. Sunday definitely had more sun than Saturday, and with the wind down (a bit), the temperature up (to ~15°C), and only occasional showers, it looked like lower scores would be required to stay in contention or move up the leader board. As I was in the top group, I would now playing head to head with the best in NZ. 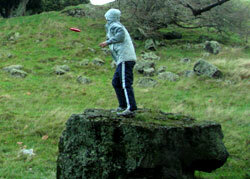 Round 2 was tight at the top and if it wasn’t for my one attempt at a roller, that hit the tree ~10m in front (Doh! ), I wouldn’t have had my only 5 for the round. Shoulda been a birdie! 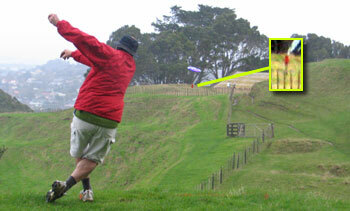 Yep, Tim's last round drive on the first was wicked, but must of caught a roller to end up down by the fence. But this confident putt ensured a par. I had 4 birdies & chances for others, including being stuck up a tree on the #15, (yes they played to 2m rule & I got caught twice during the event) and everyone was revelling in the improved conditions (sorry condies) with many more birdies & lower scores posted. Best rounds went to Simon (53), myself (54), Dean (56) & Juan (57), leaving Simon with a 3 shot lead at the top, and the top 5, all within 7 shots. After lunch & some hackysack, we regrouped & headed out for the final round. The final group was the same, but the orders were changed & my focus had changed from just playing well, to playing well enough to beat Simon if possible. A lost shot on #2 was made up on #4 when Simon’s drive made it difficult for him to make a 3. Hole #5 gave an indication of things to come, when there was a 2 shot swing after Simon 3 putted & I made a 2. Now I was only 1 down. A 4 to Simon on #8 & a 2 of my own on #9, meant that I was one up with 9 to play. After #13 it was back to level. Hole 2 required intricate accuracy - and luck! 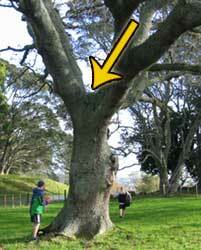 Here Chris was on his knees thanks to a luckless bounce off a tree. From there, a bogie 4 is a good result! #14 was a long (~140m), tough hole from on top of a hill, over a crater to a ledge, below the tee, where the pin was positioned. Oh, and its playing straight into the wind. There were only 2 2s during the tourney, and Dean & I got them in the final round. Simon took a 4, my lead now up to 2. #15 was again across the crater, but this time level & down wind, with a tree over the pin. Simon came back with a 2 to my 3, to be back to 1 behind, which after solid drives & putts on #16, remained a 1 shot lead. #17 is along the side of the hill, falling off steeply to the left, with the pin on the same level as the tee, ~110m away, with a tree on the left & trees on the right. 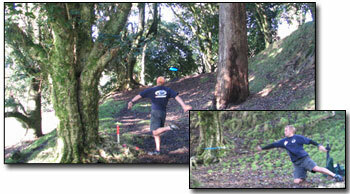 Simon still had the honour & threw a midrange low, catching a stick on the ground & stopping ~40m short. Mine flew nicely, gliding to finish ~5m from the basket pin high. Simon ended up with a 4 & myself a 2 to give myself a 3-stroke lead with 1 to play. Current NZ Champ Simon Feasey shows some roadie (I mean Ultimate) skills, driving forehand for 100m plus - wow! It wasn’t over yet as my drive got caught up the tree guarding the pin, leaving Simon with a theoretical chance of tying / winning. 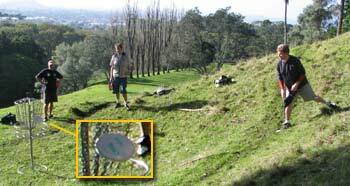 However, he may not throw the same disc forehand again as it sailed left, down the hill, close to the road - a good 70m from the basket. While I would have preferred to not have a 5 on the last, it was enough to win the event by 2 shots. Juan won the Masters trophy & also has the Open trophy at his place, as it was too big & heavy (a big rock) for me to bring home. Customs probably wouldn’t have liked it, as they didn’t like my cleats either - I got a free shoe clean because they were a bit dirty. Afterwards everyone seemed to be happy to go home and recover. While it would have been good to check out other areas of the park I could use for my course next year – the winner has to organise it the next year, I had to fly out @ 6am the next morning. What a journey it was for Deliteful Dylan - driving over 800km to walk up and down volcanic craters. And he loved it every minute of it! After a great w’end, making new friends and rivalries, I’m already looking ahead to next year’s event & other chances to play NZ tour events. I’d also recommend the trip across the ditch to anyone looking for some hot DG action. Yes - here it is folks. Simon Feasey could theoretically still force a draw here on 18, as Tim has just lodged his drive in a tree. He starts talking about a forearm - mmm we think. A strange choice, but if anyone can do it, Feasey can. He must have been thinking of an ace run. But it was more like an arse run as his disc sailed left, left, left forcing a tough recovery shots from down on the road - somewhere we never thought we'd see a player! 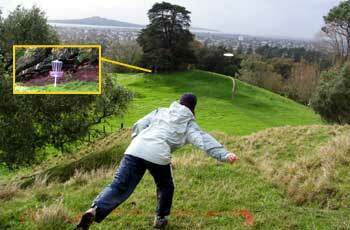 Hole 4 and players were tempted to try and throw caution to the wind for distance. Here we see Paul from Waikeke(?) - we don't have your surname for the results Paul - and let us know. 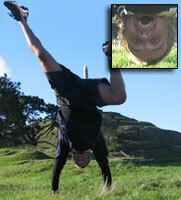 Juan Unda seems to have settled here in New Zealand - much to the delight of the kiwi gals! Here he expertly glides one of only two discs he used for the entire tournament to achieve a nice par on the longest hole - the 158m forth. Hole 8 - Dave Serf unluckily winds up resting in the crook of this big Farguana tree. 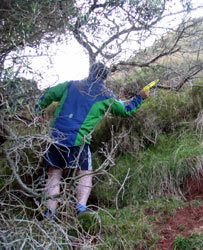 But not to be undone, the mad weatherman managed to climb up and retreive! Inclement weather did not stop Yvette and Talia from coming out to support Dad - Talia even muttered her first words: "Don't ever throw forehand on 18th Daddy!" It's that man Dylan again! This time contemplating his second shot on the scary and aptly numbered 13th. Welcome to hole 11. Not the longest, but it proved the hardest. Craters either side and 134m to the pin - about 120m to safety. Our inset shows Chris Kingsnorth driving after hassling Blair for his long walk (below)...and guess what - Chris followed him!!! Those in the know knew what a monumental occasion this was to see the Dopey Double appear at The Crater. Part of the mysterious Freaky Styley Disc Golf Cult, these two hardy souls took time out from designing alternative fuels and funding colonisation efforts to the Sun to have a toss together. Ari watches on as doubles partner Snowie has a dig at the 9th, with the Manukau Harbour in the background. With no roadie (I mean Ultimate) experience, Mike 'Ari Verderci' Wilde throws an expert sidearm on the hardest hole of them all - the 134m 11th. This hole saw many a fine player walk to the bottom of the crater to attempt some sort of comeback. And the target - the only non-basket didn't help. Our Aussie visitor took the opportunity to hassle Simon for not having 18 baskets, but we say awesome job Feasey! Its that Ari again - forehanding a second on the difficult 144m tenth hole. 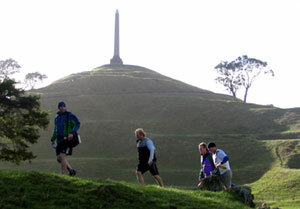 Snowie watches on against a backdrop of Mangere mountain - another of Auckland's volcanoes and a venue for the odd round of disc golf. 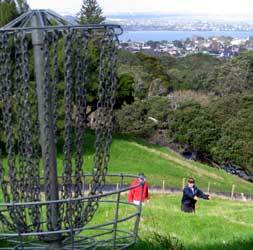 For more on the various courses we play in Auckland - and New Zealand - check out our Disc Golf Courses in New Zealand section. Talia Feasey sneeks a sideways glance at Dad, obviously unhappy with his putting in the last round! As if you cannot get enough of that Ari fellow. And that Snowie seems to be there every time (questions will be asked at the Claddagh next Monday!). Here Ari finally falls back to the backhand for his second on the 11th. Simon Feasey makes sure he has a right bias on his drive here on hole 13. Too much fade and you best grab your climbing boots! Looks innocent enough, but if we panned out we would see steep faces either side of this fairway. 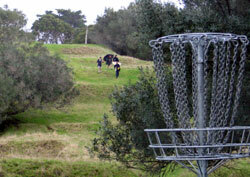 126 metres of hard yakka - hole 13 on the 2005 Crater Cup Course. Its always a pleasure to play a round with Gentle Gene, the Taumarunui lad who resides in Auckland, representing the Lost Tribe with pride. A forehand specialist (a trait of the Lost Tribe), Gene lets rip on the highly elevated tee of hole 14. This was one of the holes where, if you were unlucky with the timing of the weather squalls, you were trying to throw a disc into 80kph wind, with fierce droplets of rain stinging your eyes and face. Yeah man, this is the CRATER CUP and we love it! Freaky Styley high tech photography caught this crazy moment for Jim. See left as he throws his 5th shot after tragedy in the crater. 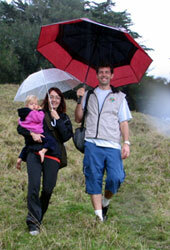 See in the middle as he walks back into the crater to recover his bag of discs that spilt and rolled to the bottom. Shades of Mark Dakiv in the 2001 Crater Cup - Classic! Hole 17 was a reverse of the traditional Crater 3rd. So the lefties prevailed - or the rightie forehanders as per Gene here who lets loose with a backdrop of Greenlane Hospital. This was a fine second by Ari on the 81m 16th - a hole targetted by many for that elusive birdie. Or closer - Juan Unda was witnessed to rattle the chains from the drive! Juan Unda - 179 and with only 2 discs!